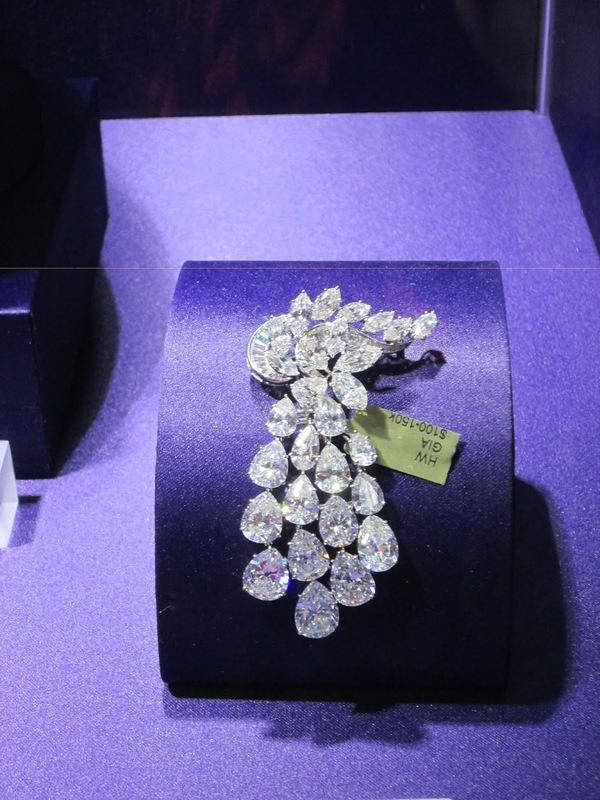 Betsy Bloomingdale's diamond brooch by Harry Winston. I read an article over at the Daily Mail about how a diamond expert “uncovered” the truth that there are giant mark-ups for diamonds at the big jewelry houses—Tiffany & Co., Cartier, Van Cleef & Arpels, and Harry Winston. My first thought was, Well, duh. The expert claims you can buy the same stone at Costco for a fraction of a price but honestly, I am having a hard time picturing any gal hoping that her guy will propose to her with a diamond ring he got at Costco. If you are in the market for, say, a diamond pendant, or diamond studs, and you want to keep the price down, as long as you do your diamond homework then I would say buy from places like Blue Nile or even Costco, and make sure any stone you purchase from them is GIA-certified. 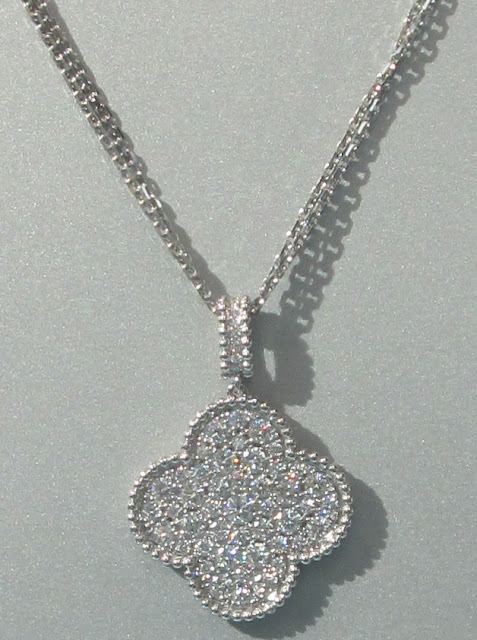 A diamond pendant is a diamond pendant, after all. But if it is design quality you are after, in addition to a fine diamond, or if the bride-to-be has her heart set on a traditional Tiffany setting, from Tiffany, how can you not at least take her there to try rings on? How could an engagement ring from Tiffany or Cartier not make your heart sing? Stories like the one in the Daily Mail annoy me. I don’t want a diamond from Costco. I want a diamond from Harry Winston! Do note Betsy Bloomingdale’s diamond brooch above. 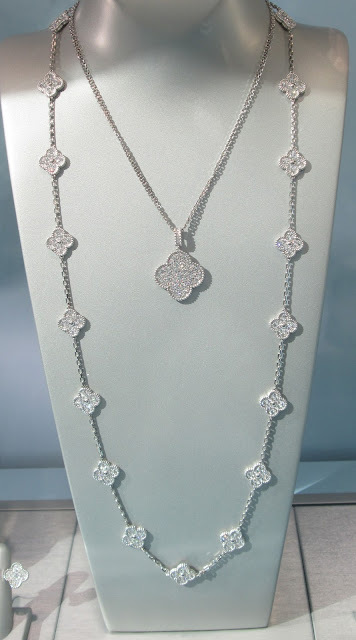 It was made by Harry Winston and I find it impossible to believe you can find diamonds of this quality from Costco! VCA Magic & Vintage Alhambra necklaces. Yes I am weeping right now. 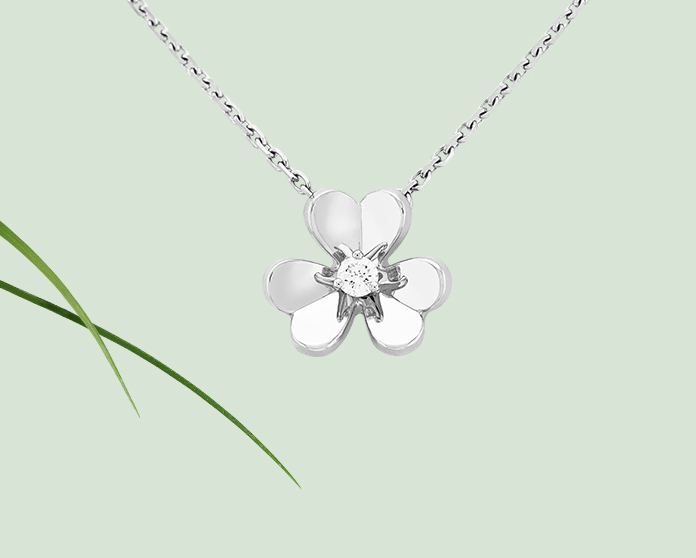 A Van Cleef & Arpels Frivole mini pendant in white gold, featuring a diamond. I love it! Photo courtesy of VCA. In addition to the price drop, Van Cleef & Arpels unveiled some new pieces in their Frivole collection, a line I just love. There are new stud earrings, new pendants, and new pavé pieces. I want them all! I love the mirror finish of the petals, as well as their three-dimensional effect. I think the above mini pendant would be so perfect for spring! If you are buying some VCA, tell me all about it (or if you need a friend to help you try on pieces at the Fifth Avenue boutique, I am your gal!). If not, let me know what is happening in your jewelry world at the moment! Around 2008 (as the recession was starting) there was an author being interviewed on TV regarding his how to be thrifty book. Wish I could remember his name & the book. He said that he purchased his wife's engagement ring at Costco at a great price & because the quality of the diamonds were excellent.